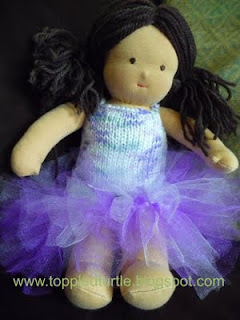 Last year I designed a knit tutu dress for my 3 year old who desperately wanted to be a ballerina for Halloween. She absolutely loved it! Fast forward to this week and I thought it'd be fun to utilize my pattern for a custom ordered waldorf inspired doll. 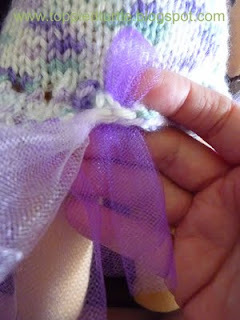 An evening of knitting and pattern editting and this is what I came up with. This is my first attempt at posting a pattern, so I hope its relatively clear. This pattern is for a 14-15 inch waldorf inspired doll. The circumference of this doll at the waistline is approx 11 inches. 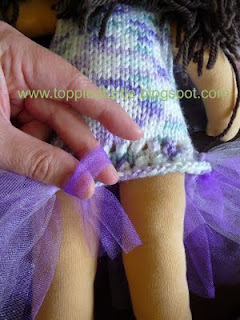 Other supplies: 48 strips of tulle cut to approx 3" by 7"
Work in st st until piece measures approx 4.5" from cast on edge. K3, attach another skein or section of yarn, bind off 12 sts, knit remaining 2 sts (you should now have 2 separate sets of 3 stitches at each end of the piece, each with their own working yarn). Bind off remaining 6 sts. Seam together the shoulder and side seams. Weave in ends. 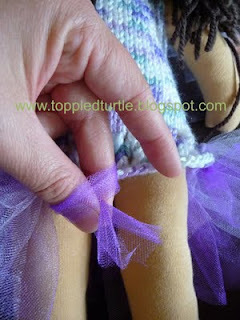 Cut 48 strips of tulle to approx 3" by 7"
Hook a strip of tulle to each yo opening at the bottom of the dress to make the tutu. 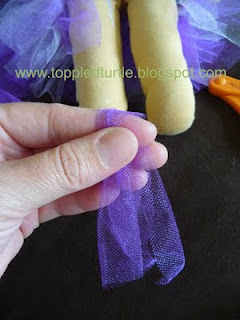 There are two rows of yo holes and tulle should be hooked through both sets of holes in order to ensure a nice, full tutu. Below is a step by step picture tutorial for how to do this. Very cool! Thank you!! 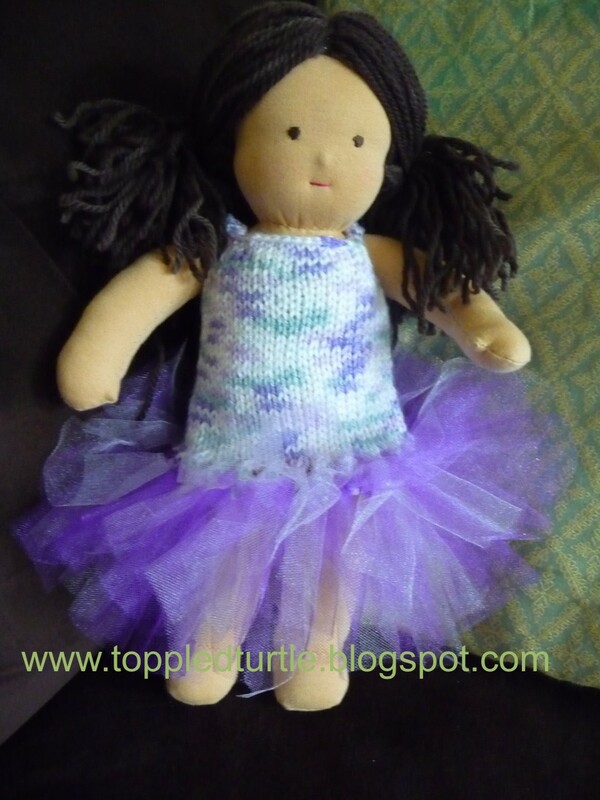 I have been looking for something cute like this as a present for an American Girl Doll owner! I will get started tonight. I've been looking for something cute for a White Teddy Bear for a Children's Hospital donation. Can you imagine pink and white and a little headband with a bow? This is so very cute! It fits the American Girl doll also, which is what I had hoped. 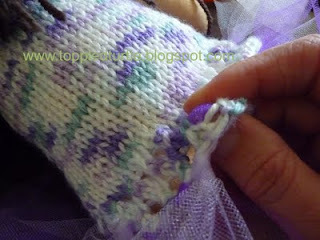 Maybe make the knit part slightly longer than 4 1/2 inches. I put a small bow on the front to finish it. Thanks!